Obesity is a global health problem that also affects older adults. In Chile, as in most of the developing countries, more than half of older adults are overweight or obese, and bariatric surgery may be riskier for this group. The aim of this study is to compare our experience in patients over 60 years of age with a control group to determine associated surgical morbidity and mortality. Case-control study of bariatric surgeries performed between 2006 and 2017 in our institution. Patients aged ≥ 60 years for the case group versus control group for patients ≤ 50 years selected randomly, matched by body mass index, type 2 diabetes, hypertension, dyslipidemia, surgical technique, and gender (ratio 1:2). Primary endpoint was surgical morbidity, 30-day readmission, and mortality. Seventy-two patients in case group were matched with 144 patients in control group. Surgical complications rate was the same for both groups. No differences were observed in the conversion to open surgery rate or 30-day readmission rate. There was no mortality in this series. 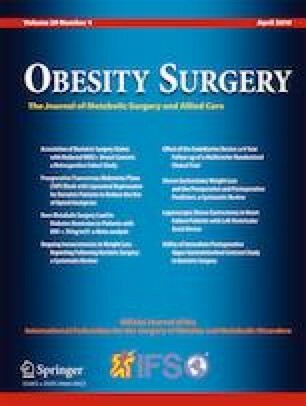 In this case-control study, being elderly does not increase the risk of morbidity and mortality associated with bariatric surgery. The authors thank statistics Professor Waldo Aranda, from the School of Medicine of Universidad Diego Portales for his valuable help in the statistical analysis and in writing the “Methods” section. World Health Organization, Obesity and Overweight, WHO, 2015 (updated January 2015). Disponible en: http://www.who.int/mediacentre/factsheets/fs311/en/. Accessed on January 2019. Sepulveda M, Alamo M, Preiss Y, Valderas JP. Metabolic surgery comparing sleeve gastrectomy with jejunal bypass and Roux-en-Y gastric bypass in type 2 diabetic patients after 3 years. August 2018. First online. 2018. https://doi.org/10.1007/s11695-018-3402-x. Organización Panamericana de la Salud, con base en datos del Departamento de Asuntos Económicos y Sociales de las Naciones Unidas. División de Población. Revisión 2017. www.paho.org/salud-en-las-americas-2017. Aguilera X, González C, Matute I, Najera M, Olea N. Las enfermedades no transmisibles en Chile: aspectos epidemiológicos y de salud pública. Serie Salud Poblacional. Santiago: Universidad del Desarrollo, Facultad de Medicina, Centro de Epidemiología y Políticas de Salud; 2016. http://repositorio.udd.cl/handle/11447/1460?show=full. Accessed on January 2019.